HGA has won four IES Illumination Awards of Merit from the Illuminating Engineering Society. The annual awards recognize professionalism, ingenuity, and originality in lighting design. Carleton College Music and Performance Commons addition to Weitz Center for Creativity in Northfield, Minnesota, integrates the Music department with the Theater, Dance, Cinema and Media Studies departments into single facility that includes a 400-seat Performance Hall, rehearsal spaces, teaching studios, and faculty offices. 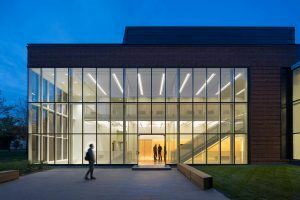 The environmentally sensitive design employs 100 percent LED lighting and energy-conscious control strategies to meet different programming and educational needs of students, faculty, and visitors. 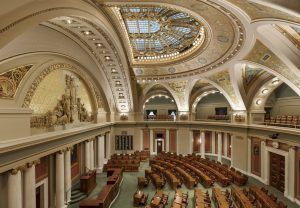 Minnesota State Capitol interior restoration in St. Paul revives the architectural grandeur of the 1905 landmark while adding modern functions. 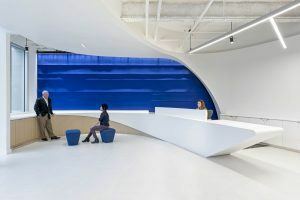 The lighting design recaptures the historic character by restoring original luminaires, fabricating replicas of missing luminaires, and establishing a cohesive aesthetic throughout diverse spaces with modern LED lighting. 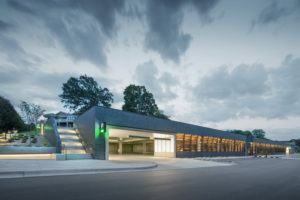 Mill Street Parking Structure, nestled into a hillside overlooking retail shops across the street in Wayzata, Minnesota, projects a welcoming, architecturally compatible experience to the bustling commercial/residential downtown neighborhood. A luminance hierarchy promotes a sense of brightness, orientation, and safety that identifies vehicular and pedestrian entries, pathways, and parking levels while balancing glare control to minimize light pollution. Visa workplace development in Palo Alto, California, recalls the Spanish origin of Palo Alto—tall tree. From the visually open exterior surrounded by urban landscaping, to the first-floor reception (the base of the tree) and the third-floor offices (the canopy), the design balances material and light to reference the structure of roots, tree trunks, and branches using direct/indirect LED lighting that reinforces aesthetics and function. For more information, visit the Illuminating Engineering Society.